Days of Heaven (1978) – Movie Review – Another Movie Blog! It’s cliche at this point to open a review of Days of Heaven with a statement of just how beautiful the movie is, but as it’s also so important to stress I will follow suit. When the first shot of the train appears on screen, shadowed against the bright morning sky after previously only seeing industrial ugliness, I always gasp. It’s languish has precedence in the work of Andrei Tarkovsky, but here its is pushed through the lens of something that elevates Americana to religious heights, combining the handheld cameras of the American New Wave with images of the golden fields of magic hour a la Wyeth and Hopper. You could even argue that the central plot has something of an old noir vibe, in a way that differentiates this killers-on-the-run story from Terrence Malick’s first film, Badlands. It’s heavenly beauty certainly makes the title make more sense. The story of runaway lovers Bill and Abby (Richard Gere and Brooke Adam) finding solitude in the working fields, along with Bill’s sister (Linda Manz) definitely Malick’s predilections with nature and mankind (it the locusts don’t give that away enough), and play with images of hell and heaven in way that shows the transcendence of such topics that occur in his later works. For me Terrence Malick can sometimes be so interested in poeticism that he forgets to be poetic, but as the greatest meeting point of both narrative and the poetic in his filmography, this would probably be my first recommendation to anyone who wants to know what to expect from his work. It ties its imagery to what is essentially a love triangle, with work by both the aformentioned Gere and Adams, as well the great Sam Shepherd, that demonstrates the solemn restraint of their characters and allows them to occasionally be lost in the images (in an appropriate way). But with that narrative he can branch off into topics that make this story so much wider: a story of class; a story of immigration; the birth of the interconnected world; the end of idyllic Americana with the advent of the Great War, and of course love, both sexual and of family (its no coincidence that Abby poses as Bill’s sister). Add all that with the amazing structural designs of Jack Fisk and constantly descending score by Ennio Morricone, and you have something almost akin to old grand artefact than a movie. 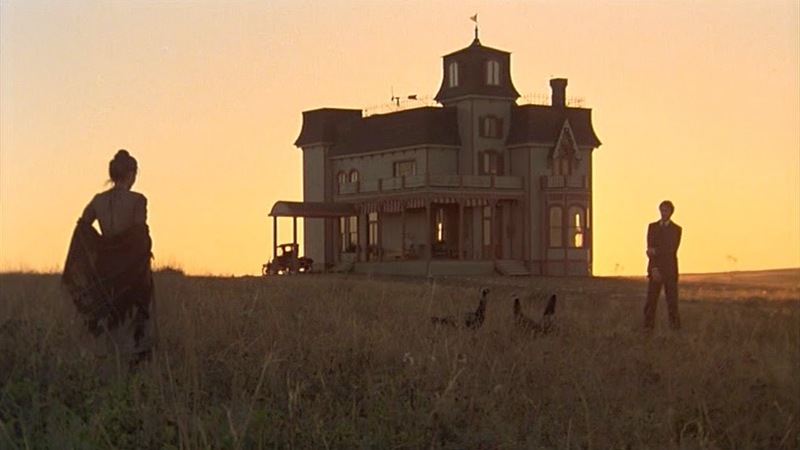 But of course, as a motion picture, Days of Heaven features some of the greatest pictures to ever be given motion.